Adam Professional Audio's Queens Bundle is a 5.1 monitoring package for pro audio applications, such as surround sound mixing and mastering. This package provides four S3V powered midfield monitors, an S3H powered midfield monitor, and one Sub2100 subwoofer. The S3V monitors are vertical in orientation, offering a 9" HexaCone woofer, a 4" Dome/Cone hybrid midrange driver, and an S-ART tweeter with an HPS Waveguide. The S3H, on the other hand, is horizontal in orientation, and will probably serve as your center channel. It sports two 7" HexaCone woofers, but the midrange driver, tweeter, and frequency response are the same as the S3V. The Sub2100 utilizes a front-firing subwoofer design to give you up to 1000W of continuous power at frequencies down to 18 Hz. A 21" woofer is on hand, as are 180° phase controls, and an adjustable crossover operating between 50 and 150 Hz. 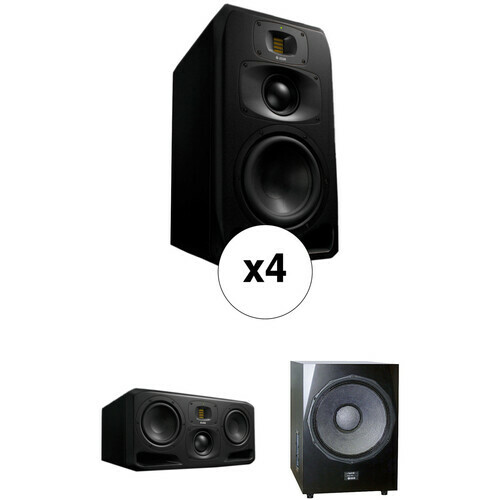 When set up correctly, these monitors will give you an accurate representation of your audio at various levels, making them suitable for professional applications. The S3V from Adam Professional Audio is an active studio reference monitor designed for vertical orientation in medium-sized or smaller control rooms. Capable of delivering 850W RMS of cumulative amp power, it features a 9” HexaCone woofer, 4” dome/cone hybrid midrange driver, and handmade folded-ribbon tweeter. The waveguides, Adam-designed mid- and high-range propagation systems (MPS and HPS), ensure a wide, stable sweet spot. Developed for transparency, the S3V’s frequency response is an impressive 32 Hz – 50 kHz. A multitude of DSP options, from equalization to delay, are provided for tailoring the monitor to the room and to personal preferences. The back panel features an OLED display and a push-button/rotary encoder to allow modification of parameters. Connect a computer to the USB Type-A jack for convenient remote access to all the S3V’s settings. Two inputs, balanced analog and AES3 digital, are available via XLR jacks. An XLR AES3 output is provided to route digital signal to the second monitor, necessary for correct digital signal flow. Vary input sensitivity and output level as needed. Load and save voicing presets for quick configuration of monitor options. If further tonal adjustments are desired, there is a 6-band parametric EQ with high-pass and low-pass filters. Use up to 5 ms of delay for timing adjustments. Adam S Series monitors, custom-developed with no off-the-shelf components, are handmade in Berlin according to strict manufacturing tolerances. The S3H from Adam Professional Audio is an active studio reference monitor designed for horizontal orientation in medium-sized and smaller control rooms. Capable of delivering 1350W RMS of cumulative amp power, it features two 7” HexaCone woofers, one 4” dome/cone hybrid midrange driver, and a handmade folded-ribbon tweeter. The waveguides, Adam-designed mid- and high-range propagation systems (MPS and HPS), ensure a wide, stable sweet spot. Developed for transparency, the S3H’s frequency response is an impressive 32 Hz – 50 kHz. A multitude of DSP options, from equalization to delay, are provided for tailoring the monitor to the room and to personal preferences. The back panel features an OLED display and a push-button/rotary encoder to allow modification of parameters. Connect a computer to the USB Type-A jack for convenient remote access to all the S3H’s settings. The Sub2100 from Adam Professional Audio is an active, front-firing subwoofer designed for strong bass response in large control rooms and studios. The large, 21" driver is housed in a specially-tuned bass-reflex cabinet to reproduce frequencies as low as 18Hz. A highly-efficient amplifier delivers up to 1000W of continuous power for a strong, linear performance with very little compression. The rear panel of the subwoofer offers XLR and RCA inputs and outputs, as well as an XLR subwoofer output for daisy-chaining. A 180° phase control is provided, as well as gain and high-pass filter controls. Box Dimensions (LxWxH) 28.0 x 19.0 x 16.5"
Box Dimensions (LxWxH) 27.5 x 19.0 x 18.0"
Box Dimensions (LxWxH) 37.5 x 34.0 x 29.5"